As consumers face wide-ranging drought situations and become more concerned about the earth's resources and the costs of energy sources, companies are working on new ways to manage our laundry. Xeros, a company founded near Sheffield, South Yorkshire in the United Kingdom, has developed a cleaning system that uses seventy percent less water than ordinary models and eliminates energy-intensive spin cycles and dryer blasts. How Does A Xeros Washer Work? The machine, developed in 2006 at the University of Leeds, uses reusable plastic beads to replace all but one tenth of the usual water and about one third of the usual detergent. The beads are made of nylon. The polarized molecules of nylon attract soil and in the humidity created by a little water, the polymer chains separate slightly to absorb grime and lock it into the beads’ cores. The machine works by having the nylon beads sit in the outer of two nested drums. When both drums rotate, the absorbent beads fall through the mesh of the inner drum to tumble with the laundry, where they dislodge and trap dirt. After the wash cycle finishes, the outer drum stops moving and the beads fall back through the mesh into the outer drum, where they await the next load. 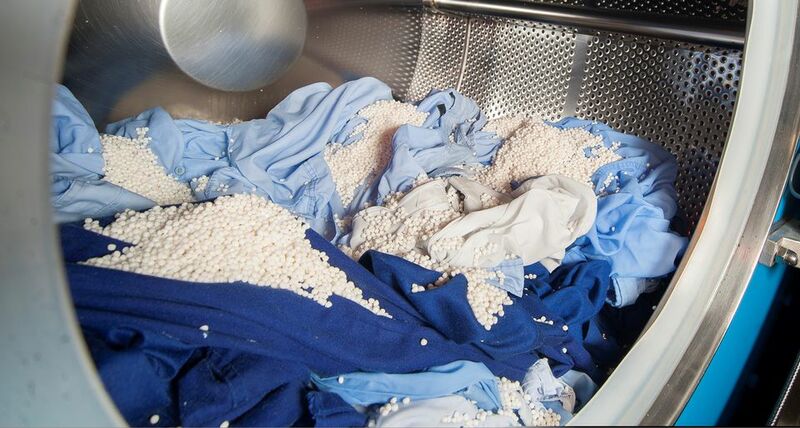 Through the use of polymer bead technology, the patented, award-winning Xeros System for commercial laundry uses seventy percent less water, up to fifty percent less energy, and approximately fifty percent less detergent, to deliver cleaning results as compared to traditional “soap and water” methods. The reusable beads have a lifespan of hundreds of washes before being collected and recycled. Xeros has developed machines for retail and hospitality commercial laundries as well as retail dry cleaning companies. Models for use at home are several years down the road but until they arrive, you can learn to save energy and money by using a high-efficiency washer and greening your laundry routine. In October 2013, Xeros officially opened its North American headquarters in Manchester, NH. The Xeros System was introduced to the U.S. market in June 2013 at the Clean Show in New Orleans. North American customers include the Hyatt Regency Reston in Reston, VA; Crest Cleaners in Clifton, VA; and Sterling Linen Services in Manchester, NH. Xeros, is also now a member of the Sustainable Apparel Coalition (SAC), which also includes household names such as Adidas, Burberry, Coca Cola and Levi Strauss. The coalition is an industry-wide group of over 100 leading apparel and footwear brands, retailers, manufacturers, government organizations, non-profit entities and academic institutions, committed to improving supply chain sustainability. Can I Buy A Xeros Washer? Currently, a Xeros cleaning system is only available for commercial laundry use. The company offers both washing and tumble dry systems for hospitals, hotels and hospitality facilities, fitness facilities and commercial laundry and dry cleaning plants. Why Do I Need to Clean the Outside Dryer Vent?